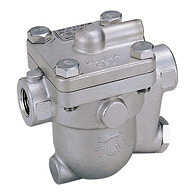 Automatic valves for the purpose of discharging condensate without venting steam. These traps utilize the difference in the temperatures of steam and condensate. A steam trap is a kind of automatic valve that discharges condensate generated during processes and in steam transport lines while preventing any steam from escaping ('trapping' the steam). Steam traps can be divided into three general categories based on their operation mechanism: mechanical, thermodynamic, and thermostatic. TLV manufactures all three of these categories. Our extensive product line-up makes it possible to select the optimal product to suit your objective or application. Each trap offers the highest level of energy conservation in its class. Much consideration is given to the aspect of maintenance, as evidenced by designs that include the unitization of parts, interchangeable parts, and utilization of re-useable PTFE gaskets. The different types of traps can also be used in numerous other types of applications in addition to those mentioned above. Contact your TLV sales representative for details.